International donors pledged $30 billion to help rebuild Iraq after the war against the Islamic State group, Kuwait announced Wednesday, overcoming Western doubts and donor fatigue over Mideast crises to help the battle-ravaged nation. While falling short of an estimated $88.2 billion needed to rebuild Iraq, it easily surpassed the $20 billion Iraqi officials initially said they needed to begin their difficult work. While much of the larger donations came in the form of loans, Iraq remains an oil-rich nation and such debts can be forgiven by the countries and institutions offering them. The pledges, if followed through with funding, could give Iraq a chance to dig itself out of the rubble left by the Islamic State group and the chaos that followed the 2003 US-led invasion that toppled dictator Saddam Hussein. Officials offered no breakdown of the pledges, though some countries announced them on the floor of a meeting held Thursday at Kuwait City’s Bayan Palace. The biggest single pledge came from Turkey, which announced $5 billion in credit to Iraq, while Kuwait’s ruling emir said his oil-rich nation will give $1 billion in loans and $1 billion in direct investments. The donation by Kuwait’s emir, the 88-year-old Sheikh Sabah Al Ahmad Al Sabah, showed the deep interest his nation has in making sure Iraq becomes a peaceful, stable country. Iraq also still owes Kuwait reparations from Saddam’s 1990 invasion that sparked the 1991 US-led Gulf War. Other major donations included both Saudi Arabia and the Kuwait-based Arab Fund each pledging $1.5 billion. Qatar pledged $1 billion in financing and donations, while Britain pledged $1 billion in export credits over 10 years. The United Arab Emirates pledged $500 million, as did the Islamic Development Bank. The UAE’s Minister of State for Foreign Affairs Anwar Gargash also tweeted there would be $5.5 billion in private investments from his country home to Dubai and oil-rich Abu Dhabi, without elaborating. The European Union also pledged 400 million euros ($494 million). The US, while not offering direct donations, did agree to providing over $3 billion in loans and financing to American firms wanting to invest in Iraq. Officials acknowledged a feeling of fatigue from international donors, especially after the wars in Iraq and Syria sparked the biggest mass migration since World War II. Even in Kuwait, some questioned donating cash while its own country needs investment. Iraq is OPEC’s second-largest crude producer and home to the world’s fifth-largest known reserves, though It has struggled to pay international firms running them. That’s even after the US alone spent $60 billion over nine years — some $15 million a day — to rebuild Iraq after overthrowing Saddam in 2003. Around $25 billion went to Iraq’s military, which disintegrated during the lightning 2014 offensive of the Islamic State group, an outgrowth of al-Qaida in Iraq. US government auditors also found massive waste and corruption, fueling suspicions of Western politicians like President Donald Trump who want to scale back foreign aid. 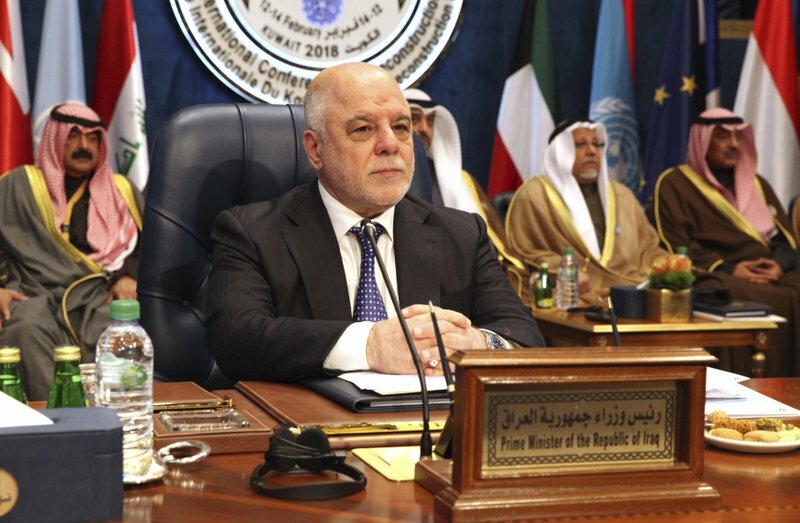 Iraqi Prime Minister Haider al-Abadi on Wednesday acknowledged the endemic fraud permeating his nation as a way to ease concerns about sending more donations into the country. “We promise we will never cease fighting corruption,” he vowed. Iranian Foreign Minister Mohammad Javad Zarif attended the meeting, but skipped a group photograph held before. Later, he didn’t give his nation’s address without explanation. Saudi Arabia and other Gulf Arab nations attending the conference remain suspicious of Iran’s influence in Iraq, as well as its gains following the 2015 nuclear deal with world powers. Meanwhile, Qatari officials shared a room with leaders from Bahrain, Saudi Arabia and the United Arab Emirates, which now are boycotting it as part of a monthslong regional dispute. An effort by Sheikh Sabah to mediate that conflict at Bayan Palace in December disintegrated. Despite those tensions and Iraq’s remaining needs, officials described themselves as grateful at with the conference’s results.